The primary focus of contact centers is conversations between your agents and your customers. To that end, Flex WFO allows you to drill down from dashboards and reports to individual conversations. Conversations that have multiple segments show a list of segments in the top right corner. The segments are listed in the order in which they happened and show talk time. You can click on individual segments to listen to them. You can play call segments of a conversation in a rich visual player that highlights agent speaking, customer speaking, silences, and cross-talks. You may also speed up and slow down playback and share the current playhead position in Player. You can attach comments to conversations at any time. Each comment allows optional free text and a category. 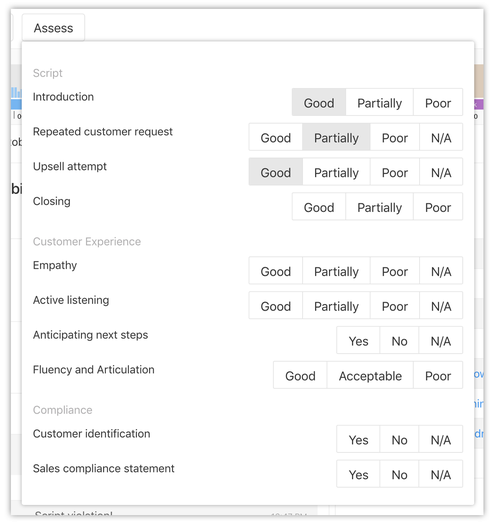 Categories enable you to quickly mark conversations as Good, Neutral, Poor, Good for Training, and other. 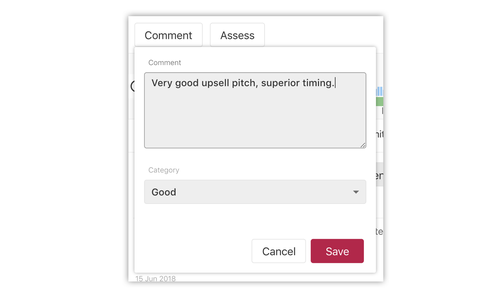 Comments are visible in the Agent Feedback pane, and you can report on them in WFO Analytics. You may assess conversations at any time when viewing a conversation. You can answer the questions with one of the available answers, which may have an attached score. You may then report on top of that score in WFO Analytics. Check how to make Assessments in Flex WFO in this article. The Conversation Screen shows basic information about the currently chosen segment. Agent Name - The name of the agent who handled the current segment. This may be different for other segments in the conversation. Handling Team - The agent's team (when handling the segment). Customer - The name or phone number of the customer. Reflection Score - If the agents have rated themselves in this segment, this is the average score of that rating. Customer Satisfaction Score - If the segment was scored in customer surveys, the average satisfaction score for the segment is shown here. Current Playhead Position - The current timestamp of the playhead. Segment Duration - The total duration of this segment. 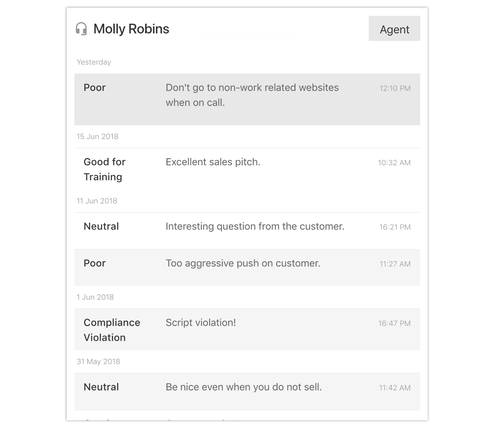 The Agent Feedback section shows all feedback received by the agent handling the conversation. The feedback is sorted from most recent to oldest. To view the conversation to which a feedback item is attached, just click on the feedback item. The Findings pane shows all findings by Twilio Speech Analytics in the segment. You can click any finding item to start playing a call from the finding position. Blue findings map to conversation segments said by an agent, green findings map to those said by a customer. Findings are sorted in the order that they appear in the call.